The Anatomy of a set… | Support. Creativity. Sorry for leaving you guys hanging! Set build + Married Life Live = no time. This is absolutely my favorite set we have ever done. It feels like a really complete thought design-wise…lots of texture, depth, and punch. The idea was actually birthed from a lack of resources if you can believe that. I had drawn up two ideas that we were pretty confident in, but between North Point and Buckhead, we didn’t have to screens to do it. So in typical creative fashion, this set was birthed on a napkin in a booth at Moe’s. 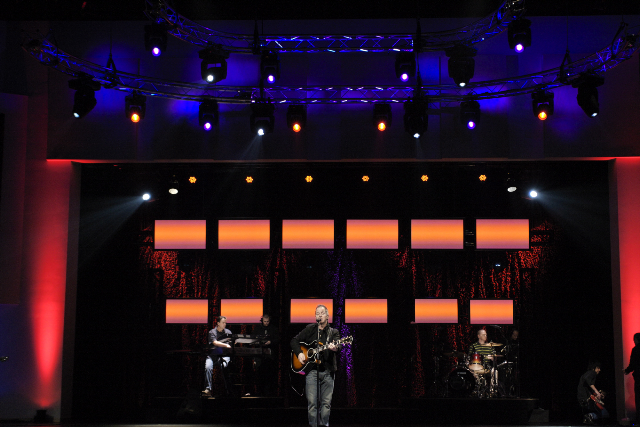 We wanted to do something completely different and sorta were inspired by the CMT look from this year (horizontal trussed faced with LED wall panels), but renting LEDs is a huge expense when you consider it is somewhat like renting a house – no long-term gain. We decided to invest in chain motors instead and I can’t be happier that we did! I like video sets, but for the most part, we are all tired of jumpbacks. The basic idea behind this set to make it stand out from other video sets we have done is to use little to no jumpbacks as content. Rather, we are using only solid colors, texture and gradients with MAYBE one jumpback in a whole set so that it is a huge impact when we use them. This idea sorta formed by watching a Gorillaz concert on MHD or Rave where basically the whole band was in silouette with color behind them (no keylight). Over all, I really love the look of this set. 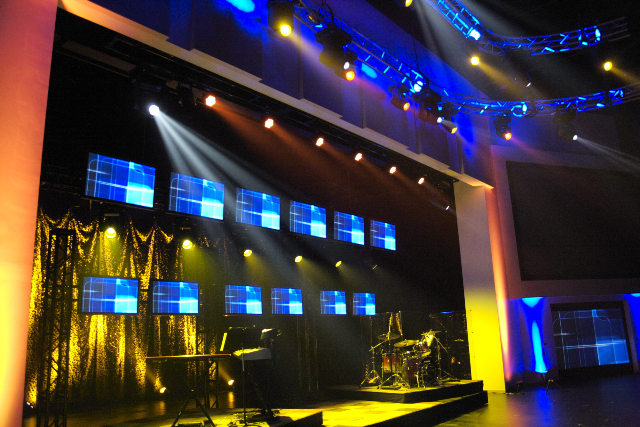 The set is made up of (6) 50″ Panasonic Plasmas and (6) 42″ Plasmas. The different sizes was actually a compromise as well, but it actually worked out to our advantage, because the 42″ end up looking further away than they actually are. 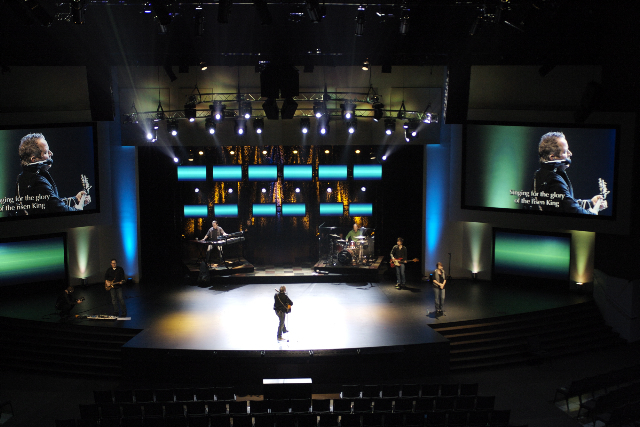 The 50 inchers and (6) Mac 250 washes w/ wide lenses we hung on a 30′ stick of truss that goes straight up in the air behind our proscenium for the message. 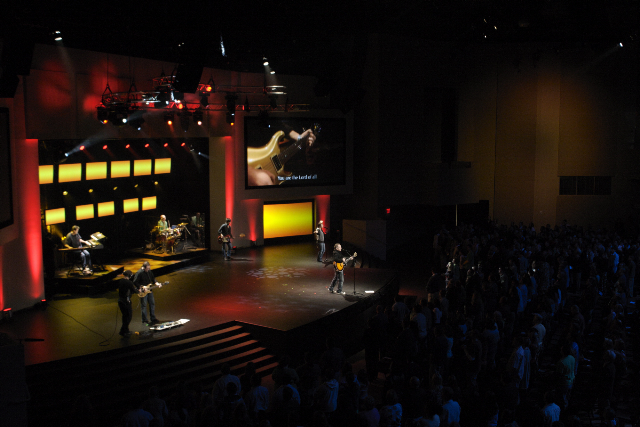 The 42 inch plasmas are hung on a pipe rigged to (4) sticks 10′ truss that are bolted to a 28′ wide riser that the drums and keys are on as well. It moves all the way to the back of the stage with the help of 2 backstage managers and 2 camera guys to get out of the way. We also ended up taking the doors under the screens off their hinges and putting (2) 8×10′ screens masked to 16×9 in them, similar to what we did in our destinations series. 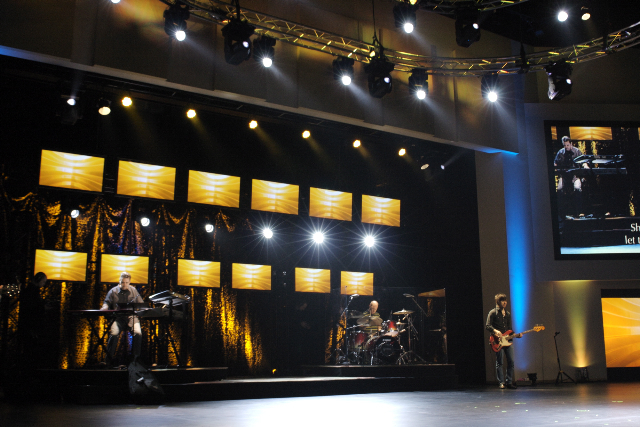 You might also notice in the pics below that we changed our rigging for the lights over the stage. We have (2 oval trusses that we parted out to make the 2 semi-circle trusses and truss warmed with LEDs (I love curved truss). The final piece of the puzzle that definitely ties it all together is the netting we used in the background. Our production director Chris was watching a Jewel concert on tv a couple months ago, and she had something (I think it might have beenAtomic Design’s Burrito wall), but it was incredibly textured and looked sorta like military foliage netting. Well, apparently you can buy a 32×16 panel of it for a little over a hundred bucks and it is the coolest texture background for cameras I have ever seen! It lights so well, actually the less lights the better because you pick up on all the texture. Just goes to show you that you get a big bang with a little money if you just keep your eyes open. 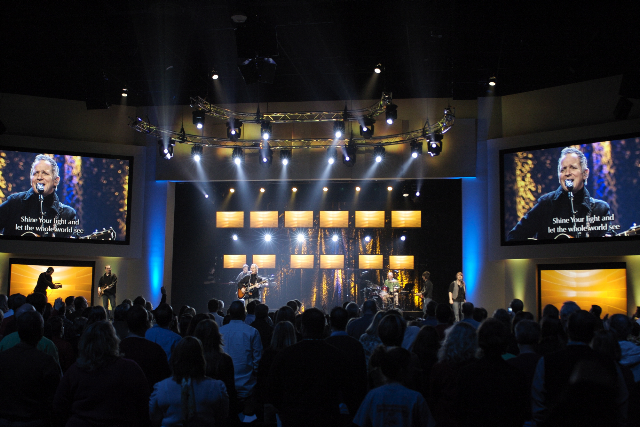 Here are a couple pics of the set…enjoy and let me know what you think! I am still waiting on your set pics! Awesome set, BJ. Do you have any video of this set in action? And what (software, hardware) do you drive all of those flat panels with? this set is so rock and roll dude! hey bro, where could one pick up the netting? Hey Ryan, it was basically the first hit on google, http://www.armysurpluswarehouse.com/ and it’s under netting…amazing stuff! I don’t have any video yet, but we can probably work something out 🙂 The plasmas are run off of two separate composite D.A.s each being fed via the loop thru on the projectors. 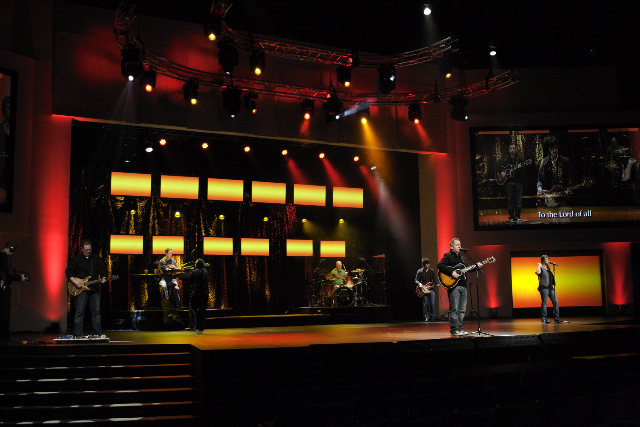 We are using Renewed Vision’s Provideoplayer for playback of the loops.